CDs and DVDs are useful for installing or running software or storing data, but in other ways, they're problematic. They're easy to lose, can be easily damaged, tough to keep track of, and they often take a long time to load. Virtual CD ($35, 30-day free trial) solves the problem by letting you create "virtual CDs"--exact copies of the CDs--on your PC's hard disk. You can then use those CDs as you can a physical CD, by dragging it to a virtual drive Virtual CD creates. 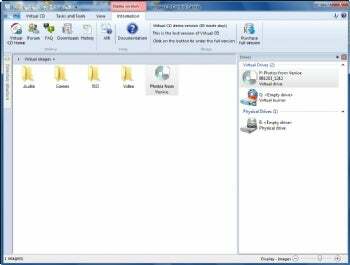 Virtual CD will make virtual copies of CDs and DVDs on your hard drive, and let you use them by dragging them to a virtual drive.